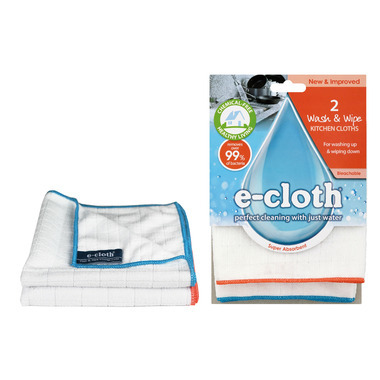 These highly absorbent cloths are great for washing up and for wiping down kitchen surfaces. The Wash & Wipe Cloths will make your washing up sparkle, as well as removing grease and grime from your kitchen surfaces. Each cloth is bleachable and guaranteed for 300 machine washes. Tips for Use: A hot rinse under a tap is often enough for day to day use. Recommend machine wash once a week and tumble or hang dry. Do not use bleach or fabric softener. I'm trying these cloths for the first time and am very happy with them. Very absorbent, nice and soft and Great for cleaning wine glasses. Might be absorbent but pick up that stinky dish cloth smell. There used to be a great exloth that wouldn't stink for months. These don't last 3 days without it. Got them when looking up norwex cloths a few years ago. When I saw the reviews I thought I'd try them out. Glad I did. I have repurchased and will keep purchasing ... Love these dish cloths. Great product, streak free finish. Love ecloths . They are wonderful to use on everything. Wash up great too! Glad Well supplies this product as I also use it in my cleaning business. Awesome, very impressed with how absorbent it is for such a thin cloth. I've used one in the kitchen and a separate one as a face cloth for the past month, and neither of them have been stained. I rinse them out after each use and laundered them after about 1 week.